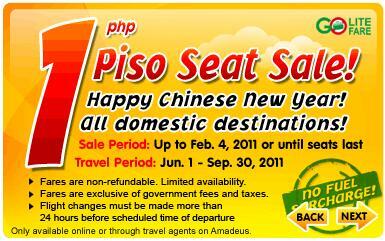 Cebu Pacific and Air Philippines Chinese New Year Seat Sales! Kung Hei Fat Choi! 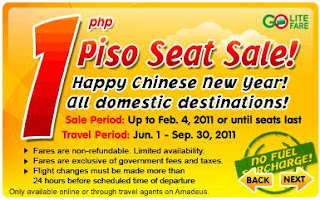 Cebu Pacific and Air Philippines are giving away their Chinese New Year treats to travel bugs. It's only 1 peso for all Cebu Pacific domestic destinations and 88 pesos for select Air Philippines domestic destinations. Take your pick! 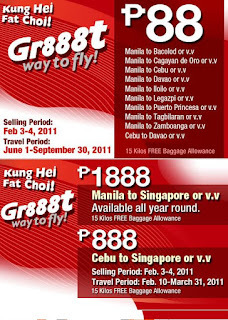 Both seat sales are only until tomorrow, February 4, 2011 or until seats last. Same travel period, too (June 1 to September 30, 2011).